Review employee information to ensure that Social Security Numbers and addresses are correct before you run W-2s. Verification is very important if you use a payroll service. Checking now will allow you to avoid costly W-2 reprints and refiling later. Schedule Bonus runs in advance, realizing that they will impact year 2013 for your employee. Make sure extra tax withholding is calculated correctly based on the bonus amount. Owners and Principals of the organization may have deductions that need to be addressed correctly on their W-2. Please review auto allowances, life insurance, medical insurance and other special deductions that could also have an impact on their earnings. This is a time of year where employees may wish to contribute more. Run a calculation on any retirement programs with an employer match, such as a Simple IRA, to ensure that the amounts remain correct after year-end bonuses and that employees have not contributed more than the maximum amount. If you have created any new benefits or deductions in 2013 please review your setup and tax implications one last time. Sometimes a new program was setup incorrectly in the beginning of the year, which has an impact to employees who originally enrolled. Any new deductions that have a pretax implication should be verified one last time. Coordinate with your third-party sick pay provider to determine who is responsible for issuing sick pay information on employee W-2s. Be certain to include taxable third-party sick pay earnings in payroll. 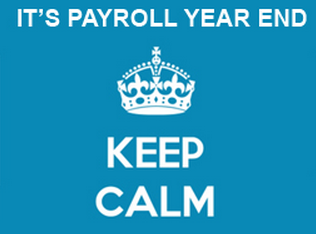 If you are running in-house payroll make sure to order your W-2 forms soon!